Enhances hair density. Improves tensile strength. In the case of diffuse hair loss (gradual loss of hair over a period of time), usage of Himalaya Herbals Hair Loss Cream results in a 20% reduction in hair loss in 2 weeks. Continued use of the cream ensures up to a 70% reduction in hair loss in 6 months. 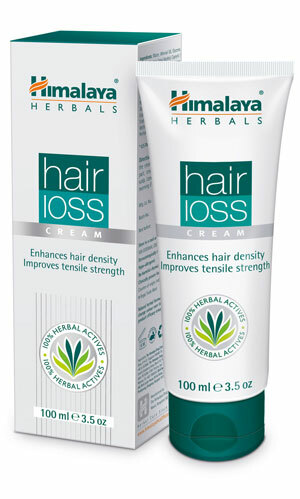 Gently massage Himalaya Herbals Hair Loss Cream into the scalp, part by part, covering the whole scalp. Leave overnight. Rinse in the morning if desired. Note: Himalaya Herbals Anti-Hair Loss Cream does not work in cases of male pattern baldness (baldness due to genetic reasons).